I love summer rolls — crunchy, fresh, and flavorful all wrapped in a delicate rice paper wrapper. Summer rolls are one of those things I never thought I could make at home. The wrappers, the rolling, the sauce! Not only are they way easier than I imagined, but they can be quite the nutritious dish to boot. Filled with loads of raw veggies and herbs, a summer roll is like a salad all wrapped up in a neat little package. In the video above, I go a pretty traditional route with avocado, cabbage, carrots and herbs, but also I use less traditional roasted sweet potato sticks and shredded Brussels sprouts. Rice paper is so neutral. Who says you couldn’t put a cobb salad in there or poached chicken, corn, cabbage and barbecue sauce? I say the sky’s the limit and can we talk about perfect these would be for school lunches?! Per-fect! If you want to make these in advance, cover them with a damp paper towel and refrigerate for ideally up to one day, but I’ve even kept them 2 or 3 days. To make the summer rolls: Drizzle the sweet potatoes with oil and sprinkle with salt and pepper. Roast in a 400 degree oven for 18-20 minutes until tender. Fill a shallow baking dish or a skillet with warm water. Soak 1 rice paper round (make sure there are no holes) in warm water until pliable, 30 seconds to 1 minute. Remove from the water and transfer to a plate or cutting board. pinch each of the Brussels sprouts, cabbage, and carrot, a few sticks of sweet potato, and a couple of avocado slices, taking care not to overstuff. Roll up rice paper tightly around filling, folding in sides and continue rolling. Transfer summer roll to a plate and cover with dampened paper towels. Make the remaining rolls in the same manner. Serve rolls halved on the diagonal. Store in the fridge covered with a damp paper towel 2-3 days. * Sauce can be refrigerated for up to 5 days. Bring to room temperature and re-emulsify before using. 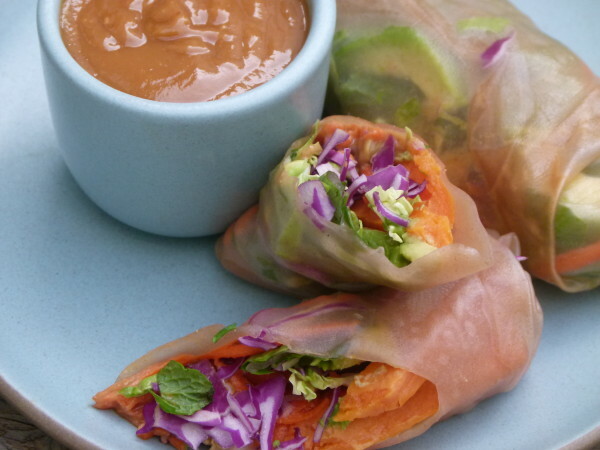 You are going to have so much fun making these summer rolls! By the way, I have a YouTube channel! I would love it if you subscribed over here. Thank you! I love this! I never would have tried to tackle this without the video. You make everything look so easy. Thanks for exposing me and by extension, my family to so many new and wonderful dishes!